Jackson, Mississippi, 1962. The coloured maids and nannies are raising the white babies while their mothers are busy maintaining their appearance and holding Daughters of the American Revolution-meetings. The racial segregation is on its peak while the Civil Rights Movement was under way. Aibileen is one maid/nanny who has raised many white children, but always changes household when the children start school. She is currently working for a woman who is building a toilet in the garage for Aibileen to use because she worries about black diseases. Minny is a maid that never is able to keep a job for a long time because she always talks back to the employer. And then there’s the young Ms. Skeeter, a white woman who has just moved back to her parents after graduating from college and she wants to become a journalist. Ms. Skeeter finally gets a job for the local newspaper, writing the domestic section. As she knows nothing about keeping a house clean, she asks Aibileen for help. She has also applied for a job in New York city, but receives a rejection along with tips how to improve her writing. 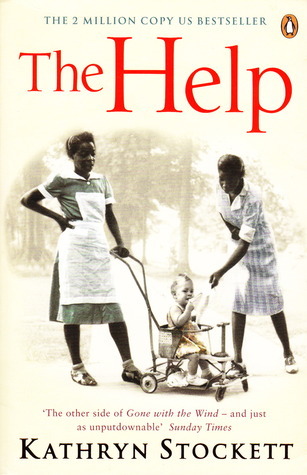 And this gives her the idea for a book; a book about the relationship between coloured maids and nannies and their white employers. But the problem is to get the maids to help her, they’re terrified of being found out as the consequences are enormous. Once I got past the first chapters narrated by Aibileen, I hardly could put the book down. But the slow start sort of ruined it for me, I think this book would have been much better if it had started with Ms. Skeeter. I’m also torn between really liking the characters or just sucking up to the stereotypes. Some of the white women are hilarious, and especially Ms. Skeeter’s mother and the most important young woman in town, Hilly. I’m not sure if I really enjoyed the book or not, and I can’t really pinpoint why or why not either. It was an easy and fluffy read and exactly what I needed right now. Really looking forward to seeing the film!